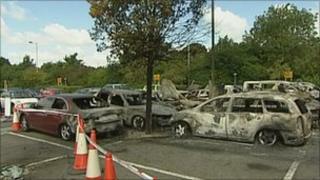 A fire that damaged 24 cars at Stansted Airport in Essex is not being treated as suspicious, police have said. Fire crews were called to the airport's long-stay car park in the early hours of Sunday and arrived to find several cars alight. An investigation was begun into the cause of the fire, which is now thought to have been sparked by an electrical fault in one of the cars. The fire affected vehicles belonging to holidaymakers.